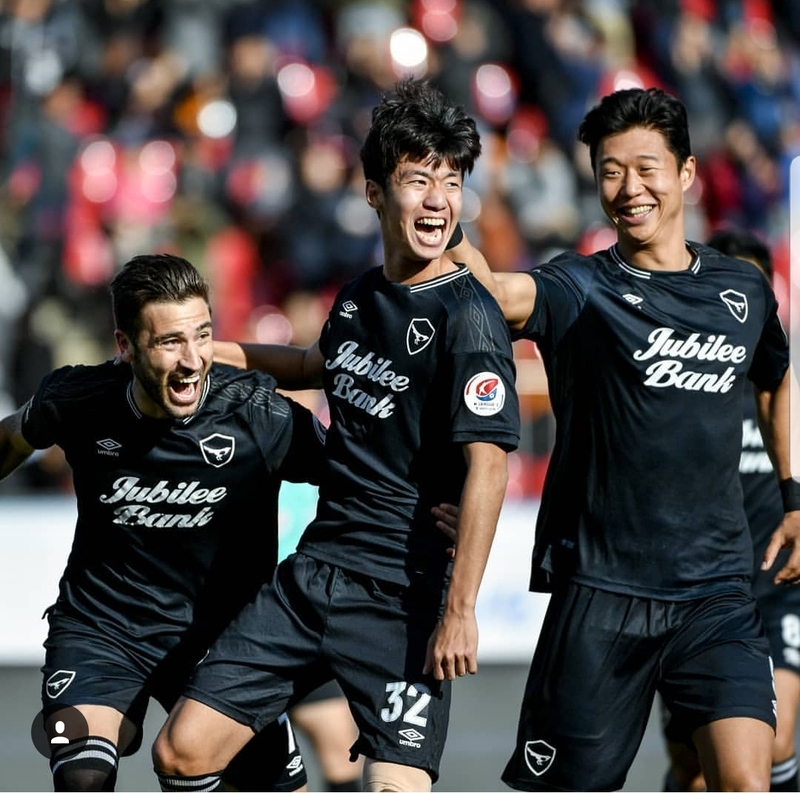 The first in a new series of full-time ‘afterthoughts’ is from today’s Seongnam v Daejeon K-League Two match as 2nd place hosted 4th in what was a huge match for both teams in their pursuit for promotion to the K-league One. 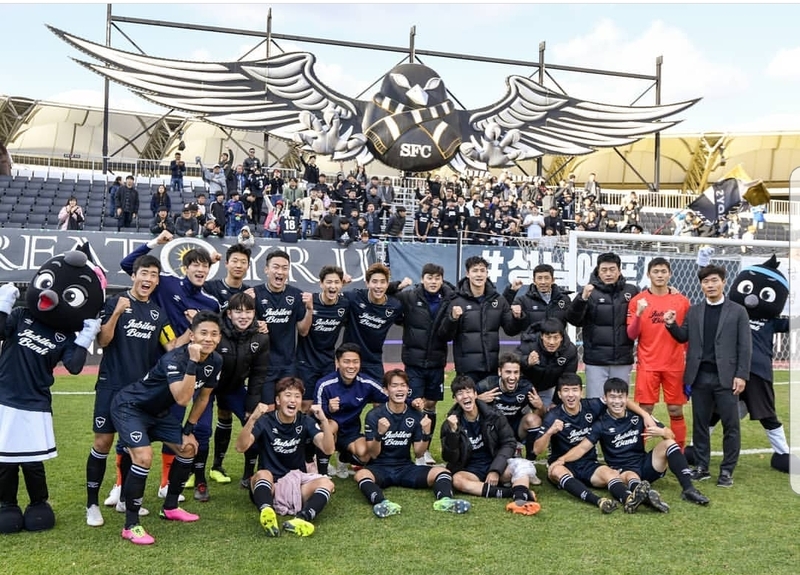 Seongnam went into the game on the back of a 1 win in 7 run that had seen them not only surrender first place and the K-League Two title to Asan (The Police) but had also allowed Busan I-Park to pull to within 2pts of 2nd place and the potential automatic promotion that might still come with it. To say it was a must-win match was an understatement and one that I’m guessing Nam had finally managed to get across to the players after weeks of lackluster disappointing performances . The first half was a fairly even affair with Daejeon probably carving out the best chances in the opening 40 minutes or so and were probably heading towards HT as the happier of the two teams. On the stroke of half-time Seongnam thought they had taken the lead as captain Seo Bo-min scored direct from a corner kick but unfortunately for The Magpies the goal was controversially chalked off for an alleged foul on the keeper after a brief VAR consultation. It was a pretty ridiculous call and was yet another example of why VAR drives the passionate football fan crazy. But despite protests from the hosts 0–0 would be the score on the big screen as both sets of players made their way towards the tunnel for the break. It was almost as if the Seongnam players took that decision personal as they came out for the second half a completely different team and grabbed the game by the scruff of the neck and within only 2 minutes they took the lead. Moon Sang-yun picked the ball up just outside the box and twisted and turned his way past 3 Daejeon defenders before calmly slipping the ball past the Daejeon keeper. Moon was integral in the great start to the season that Seongnam made and it’s been no surprise that as his form dipped so to did the fortunes of the team. Sensing blood the hosts started pouring forward in waves and it was only a matter of time before they got a second, this time courtesy of a Kim Min-hyeok header from a pinpoint Seo Bo-min cross. The captain is one of the sweetest crossers of a ball in the league and it was fitting that he would be involved in the winning goal given his first half goal being disallowed. Daejeon looked shell-shocked and to be honest Seongnam could have added another two or three as firstly Jung Sung-min then Eder missed open goals when it looked easier to score. In the end though those two goals would be enough as even as Daejeon threw everything at Seongnam in the last 10 minutes or so it was to no avail. Unfortunately the victory wasn’t enough to keep the title race alive as Asan easily defeated Seoul E-Land in the Olympic Stadium to clinch he trophy with two games to go. 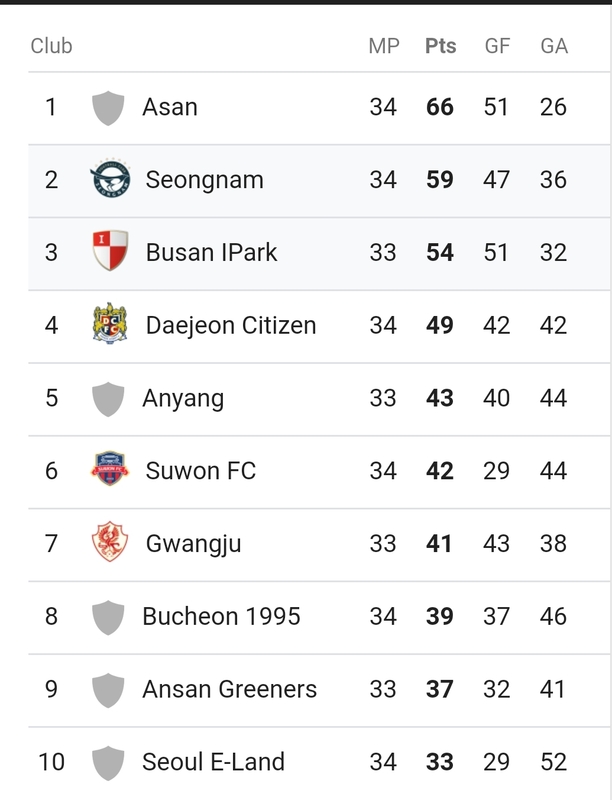 It does, however, put a marker down for Busan who welcome Ansan to town tomorrow knowing that failure to win would leave them a mountain to climb in order to prise 2nd place away from the boys in black.